Society for "the publication and dissemination of literary, scientific, and religious works giving instruction in the principles of the Jewish religion"; the third of its kind in the United States (see Jew. Encyc. i. 519). Its headquarters are at Philadelphia. It was founded June 3, 1888, at a convention held in Philadelphia. At the end of the first fiscal year the membership was 1,071; by 1903 it had reached 4,700. Every member of the society receives a copy of each publication; since the society has been in existence over two hundred thousand volumes have been distributed and sold. The society is supported by the income derived from a permanent fund and from membership dues. As a rule, four, sometimes five, publications a year are issued; the first, "Outlines of Jewish History," by Lady Magnus, appeared in 1890. The society issues two series, a "Special Series" (seven numbers), appearing occasionally, and including short works of a miscellaneous character, and "The American Jewish Year Book," published since 1899-1900 (5660). Besides the twelve volumes of these two series, the society has brought out thirty-one works (thirty-eight volumes), among them translations from German, French, and Hebrew. They include histories, literary, religious, and ethical essays, poems, biographies, proceedings of societies, republications of older classics, and fiction. The most important undertakings of the society are the publication of the English edition of Graetz's "History of the Jews" (six volumes), and a new translation of the Bible into English, first suggested at the second biennial meeting, June 5, 1892; only the Book of Psalms has appeared (1903). Other notable publications of the society are: "Children of the Ghetto" (Israel Zangwill); "Studies in Judaism" (Solomon Schechter); "The Ethics of Judaism" (M. Lazarus); and "Idyls of the Gass" (Martha Wolfenstein). 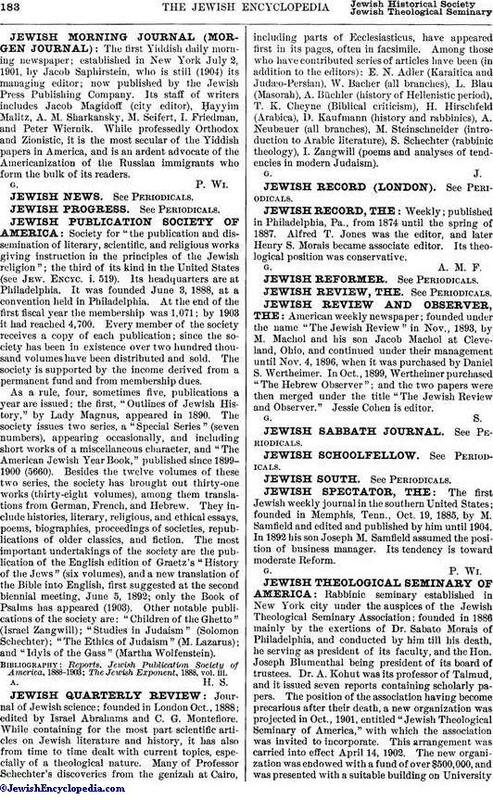 The Jewish Exponent, 1888, vol. iii.